Portland Saturday Market next weekend! Hello! How are your spring? The trees and flowers are blooming new energy! They are beautiful healing for many kinds bird, wild animals and us. I will be back to the Portland Saturday & Sunday Market on 28, 29 April! I'm looking forward to see you all at there! I visited to City College of San Francisco to see the mural of Diego Rivera after my Art Show. I was first impressed by Diego Rivera's Art when I was 20 years old in Mexico. I felt his spirit's passion of Art and learned what is Art. Art have power that is changing life of people. to many kind of people in the world. This time I felt his mural that painted 40 years ago still tells his heart to all people. We need have eyes to envision of magical future. You were given to me New Dream of Art. Thank you so much for coming Art Show! 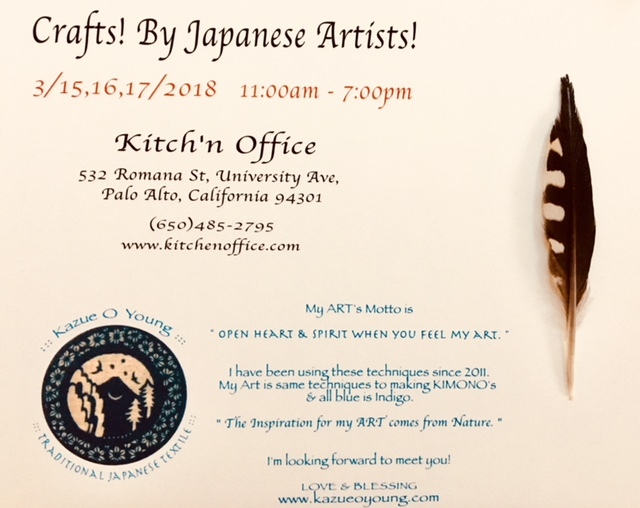 Thank you so much for coming Art Show at Kitch'n Office in Palo Alto! you all made me full of LOVE. New Greeting makes new energy.
" Thank you for bringing Oregon weather, we need rain." " oh It is my pleasure." when I walked outside in Palo Alto, it was not rain or after rain. The after rain made shiney flowers and trees. California's weather and Oregon's make very different eco system. I was very enjoying the birds' songs in the morning with coffee. This Art Show had many possibilities for all people. Thank you so much and I'm looking forward to see you again. My interview is on their HP’s first page! I’m just for thankful to their support. I’m in Palo Alto now. Here is many magical miracles. They made article of my artworks in Japanese. I am very impressed this. 11：00-18：00　Casual KIMONO wearing experience event! Portland Saturday & Sunday Market is 45th this year! It is so amazing market! I respect all artists who make(made) the market continue for wonderful world! The booth is #307 at PSM this year. My booth is not always in the same spot. Please ask my husband where I am. I'm there on 3&4th March. I will be there next in April, Please check up NEWS on my website. All artists of market and I are looking forward to meet you all! Thank you for your support for local artists. I was impressed this picture of old town Portland that I found at the library. I will be at Art Show of Palo Alto, CA after this weekend market. Please check NEWS on my website or under this blog. The nature has great energy for us like a medicine. I respect all nature, when I'm inside forest with them. They show me myself like a mirror. The nature spirits feel who I am more than me. I am just breathing deeply inside them. In forest and Mountain is healing all. My energy is full of love now!
" We are living in Inspilation & Dream in LIFE. " I went to Estadic Dance in Portland on Sunday& I got the message. It was very meditation for my body, soul & spirit. "We are chosing own way by own self. Your chose make many kind of happening & emotions by yourself. It is not from somebody's idea & actions. It is your choice in your life. Please don't control another ways what you don't chose. It's OK, It's good for all. These are message from in our heart. Have a wonderful your life. Palo Alto, California in March! I'm very excited to have my art exhibition in Palo Alto, CA in March!
" on 15, 16, 17th March "
Please check " NEWS" on my website. It is " DREAM COME TRUE ! " It is my first exhibition in America. please tell them about this. I'm very glad to meet you all, 2017! I'm missing there already to be there! My booth's neighbors, all were very sweet and very kind for me. I have been very full of love from you all still. I hope I would like to be same spot next year! Thank you so much with your love and smiles! I'm looking forward to make new art and meet you all again next year! on 3th & 4th March 2018! Please check " NEWS" on my website after New year. One early morning was ice weather. It looked like crystal morning. They make beautiful art too. I'm really enjoying it this year! Thank you for coming my booth to see my artworks this year. I'm very full of love when I touch your heart thought my artworks. I am very happy to see you every year and you felt my evolving for display and ART. I had many special moments last weekend at my booth in Eugene Holiday Market. You are happy with my artworks is my pleasure. Many many awesome artist are with me. We are here every weekend until Christmas Eve. Eugene Market is oldest market in USA. I'm very respecting for creating this market & all artist. Thank you for messaging to me about my ART! I'm very very happy & glad to hear it from you. I'm very full of love from you all. I have been three times at Eugene Holiday Market this year!!! It is very beautiful and amazing market! I'm very happy to meet you all there.